At Clipper City Containers we offer 12, 17, 20, and 30 yard roll off dumpsters. Whether you need multiple dumpsters for a contracting job or a smaller container to remove debris from your home, we have the right size dumpster for your next project. Look through the descriptions below to get an idea of our dumpster sizes and pricing. You can always call (410) 591-8614 to get the current dumpster sizes and pricing in Baltimore, MD. Clipper City’s friendly customer service will help you decide the correct dumpster size for your next project. For current pricing on all of our dumpsters call (410) 591-8614. 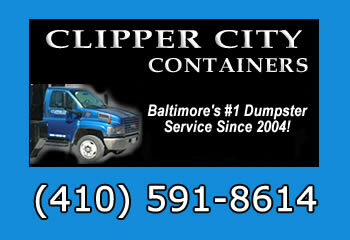 Rely on Clipper City for all of your junk and dumpsters needs in Baltimore MD and surrounding cities. For current dumpster sizes and pricing on all of our dumpsters call (410) 591-8614.